Here we have 3/4 BM trying to crack the ‘Match the Teacher to the book”. Hi, it’s me, Erin. Today I will tell you about the last 2 books for Book Week. 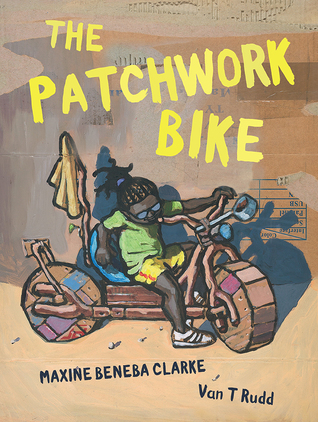 The Patchwork Bike is one of them. It is written by Maxine Beneba Clarke. The illustrator is Van T Rudd. The second book is Out by Angela May George. It is illustrated by Owen Swan. Have you read either of these books? Let us know what you thought of them in the comments section! 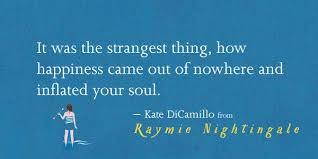 Today I will be telling you about a book called Raymie Nightingale by Kate DiCamillo. You might know some of her other books – The Miraculous Journey of Edward Tulane, The Tale of Despereaux, Because of Winn-Dixie and Flora and Ulysses. This is a book about a girl called Raymie Clark. Her friend calls her Raymie Nightingale because she always carries a book about Florence Nightingale. Raymie’s father moves away and she enters a contest to get her face in the newspaper to make him proud and come back. This book is about friendship, family and loss. I really enjoyed this book and would recommend it. Keep your eyes peeled for it in our school library. Hi, my names Erin. I am one of the Library Monitors. Today I will be presenting 2 of the shortlisted picture story books for 2017. One of the books is “One Photo“. It was written by Ross Watkins and illustrated by Liz Anelli. It’s about a dad who records what he most cares about with his camera. The second book is called “Mechanica”. It was written and illustrated by Lance Balchin. This book has an important message that we need to take better care of our world. Have you read any of these books? Do you think one of them will be chosen as “Book of the Year?” Let us know in the comments section! 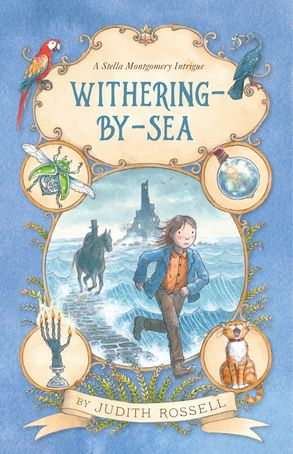 I’d like to tell you about this fantastic book called “Withering-by-Sea” by Judith Rossell. It is about a young girl called Stella who lives with three horrible aunts who treat her like a servant. One day a suspicious man comes to stay at the hotel owned by the aunts called Hotel Majestic. This leads to a big mystery. This term the 5/6s Inquiry topic was “Can we live on Mars?” In the future, we might! But for now, let’s take care of Earth! Why do we celebrate the seven Sacraments? How do people know that God is real? Do you have to be baptized to be a Catholic? How did the Bible begin? Why is the Church a sacred place? Please comment or add a question you would like to find the answer to about the Catholic Religion.